If you have accidentally deleted your important WhatsApp messages and want to see them, then you will be glad to know that it is possible via WhatsApp’s data restore feature. You will be able to recover your deleted messages and see them in no time as the process of restoring messages is not very lengthy. 2 Ways to See WhatsApp Deleted Messages? As mentioned above, you can easily recover your WhatsApp messages by restoring data from a backup. 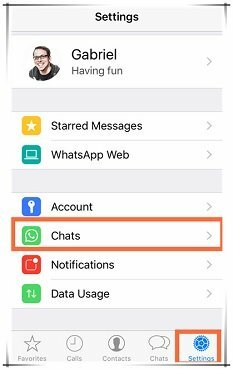 WhatsApp automatically backs up your conversations and other related data unless you have disabled the feature in settings. It is recommended that you don’t create a new backup if you have accidently deleted your messages because this will erase your recent backup and eliminate your chances of recovering your important messages. Step 1. Open WhatsApp on your device. Step 2. Navigate to Settings > Chats > Chats Backup. Step 3. Now check the date and time of the most recent backup. If you think that your most recent backup includes your messages that you wish to recover, then proceed to the next step. Otherwise, you will need to use a different method. Step 4. Uninstall WhatsApp and reinstall WhatsApp again via App Store. Step 5. Launch the freshly installed WhatsApp from the home screen. And accept the terms and conditions and input your phone number. Step 6. 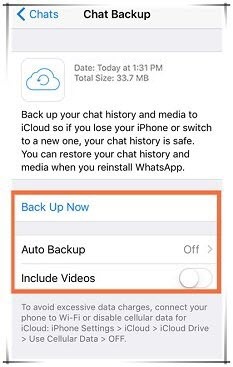 Now restore your messages by using the Restore Chat History option when WhatsApp notifies you that a backup exists. Once the restore process is completed, you will be able to see the messages that you had previously deleted. 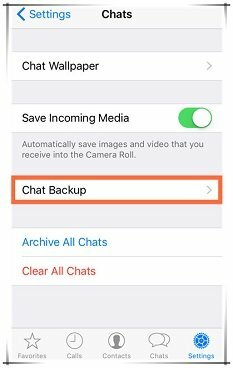 Use this method if you have multiple WhatsApp backups and restoring the most recent backup did not recover the messages that you want to see. WhatsApp does not ask you to choose a backup for restoration, instead it selects the most recent backup and restores it. So, you will need to use a file manager in order to rename a backup that you wish to restore in order to trick WhatsApp in thinking that it is the latest backup. Step 1. First, download and install File Manager from App Store. Step 2. Now open the File Manager and navigate to sdcard > WhatsApp > Databases. Step 3. If you cannot find your data in your SD card, then check your phone’s internal storage. It might be stored there. Step 4. Once you have located the backups, select the backup that you wish to restore and rename it. Change its name to msgstore.db.crypt12. It will be shown as msgstore-YYYY-MM-DD.1.db.crypt12. Step 5. Now uninstall and reinstall WhatsApp and restore the backup. If you want to permanently erase your WhatsApp messages to protect your privacy, then it is highly recommended that you use iMyFone Umate Pro for this purpose. 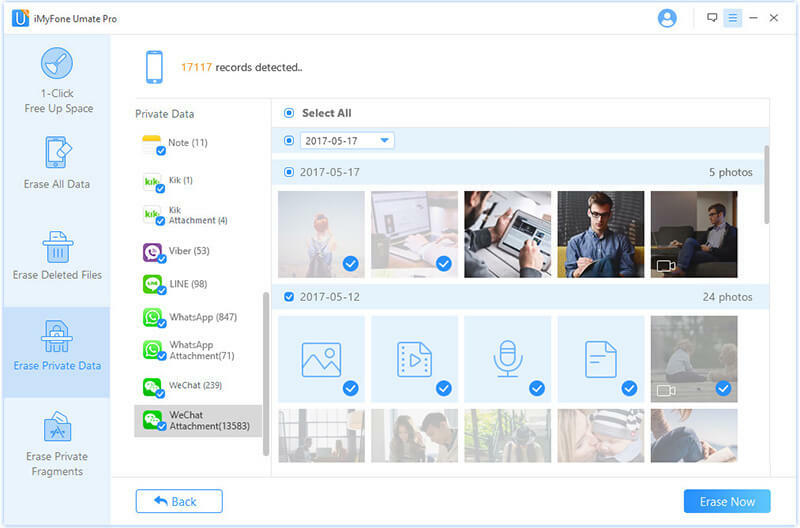 iMyFone Umate Pro is equipped with advanced and powerful features and allows you to erase any kind of data (including WhatsApp messages) from your iDevice permanently. Data erased via iMyFone Umate Pro cannot be recovered so there will be no risk of privacy leak. Erase WhatsApp messages permanently and prevent them from being recovered. Erase WhatsApp media and attachments such as photos, videos, documents, etc. permanently. Erase data fragments of WhatsApp such as cookies, app cache, temporary files, corrupted files, etc. permanently. Step 1. Launch iMyFone Umate Pro on your Windows PC or Mac. And connect your iDevice via USB cable to your computer. Step 2. From the home page of Umate Pro, select Erase Private Data mode and click on the Scan button to proceed. Step 3. Once the scanning process is completed, you will see a list of your private data. On that screen, click on WhatsApp and WhatsApp Attachment tabs and select the data (messages, videos, photos, etc.) that you wish to permanently erase. Step 4. Click Erase Now button to proceed. Permanently erase all types of data such as notes, videos, playlists, photos, music, etc. by overwriting it. 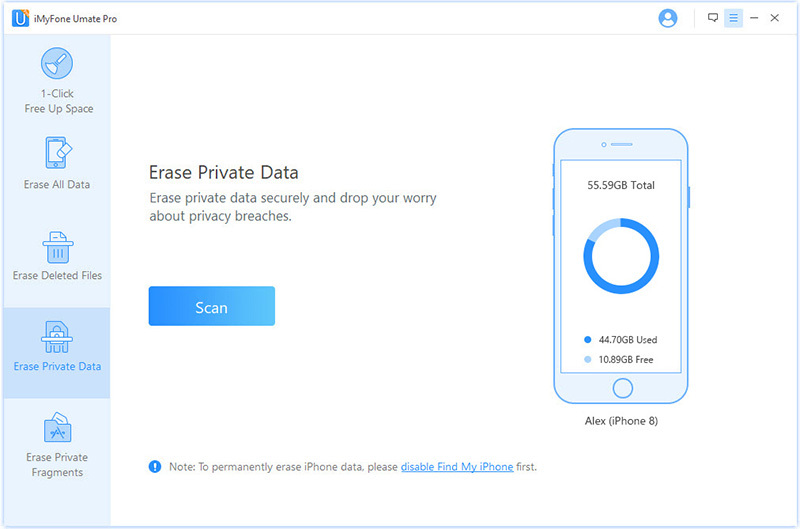 Scan and permanently erase deleted data from your iDevice. Preview and selectively erase data according to your preferences. Free up space and optimize your iDevice’s performance via 1-Click Free Up Space mode.